I often mix coffee brands and flavors. 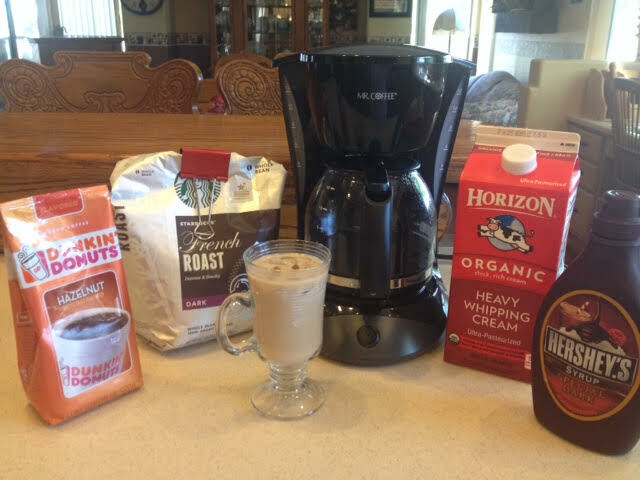 Today I brewed Dunkin’ Donuts Hazelnut with Starbucks French Roast. I like my coffee with cream, and this morning I stirred in a small squirt of Hershey’s dark chocolate syrup, as well. When I say I drink two cups a day, I’m talking about real cups, not big mugs or tiny 6 oz mini cups. As I type this post, I am enjoying my third cup over ice, one more cup than usual. The same day I substituted herbal tea for coffee, I developed a severe headache over my eyes that radiated to the back of my skull and spread to my neck. Did I suspect coffee withdrawal? No. It was a HORRID headache. I thought it might be a brain tumor. God can heal brain tumors, so I was sure it would go away overnight. I asked Steve if he thought there was any possibility that my headache could have been caused by not having my morning coffee. Certainly, he told me, it could have been caused by that. Still, I didn’t seriously believe coffee withdrawal could cause the super-bad headache I was suffering. The next morning I brewed herbal tea again. (Yes. Believe it or not. I did.) By the end of the day I thought the brain tumor might kill me. I went to bed, but I couldn’t sleep. I got up and googled coffee withdrawal symptoms. Along with finding out that I probably was afflicted by coffee withdrawal, I read that drinking one cup of coffee might reverse the symptoms or eliminate them entirely. One cup of coffee. What should I do, I considered. I could brew a pot of coffee at midnight and expect to be wide awake all night long from the effects of caffeine, or I could go back to bed and stay awake the entire night enduring a terrible headache. I brewed the coffee, drank one cup, and 40 minutes later the headache was completely gone. Really! I didn’t sleep well, but I felt fine. No more headache. The moral of the story is simple. If you want to quit coffee, do it gradually. Steve did it that way and never suffered any symptoms whatsoever. This entry was posted in Coffee, Memoir and tagged Coffee Addiction, coffee brands, Coffee Habit, Coffee Withdrawal, Dunkin' Donuts Hazelnut, Eliminating Coffee, Habit, Herbal Tea, Hershey's Dark Chocolate Syrup, morning coffee, Peppermint Tea, Reverse Symptoms, Severe Headache, Starbucks French Roast, withdrawal symptoms. Bookmark the permalink. I don’t like coffee, but I must have my morning iced tea…regular tea strong with sugar. As addictions go coffee and tea maybe not so bad. Besides I have read that a cup of coffee or tea every day is good for you. I do like iced coffee on these warm days! I have noticed a headache on days I don’t have a cup.